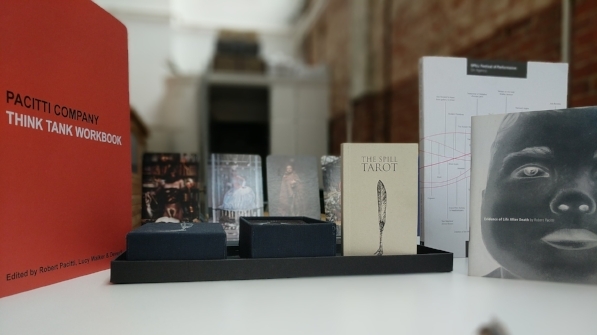 Welcome to our shop, where you will find books, limited edition artworks, items from SPILL Festival. Pacitti Company has been making artwork since 1990, spanning performance, installation, film and video, object making, sound, texts and publishing. Some works have been small or unassuming in form whilst others have involved large numbers of people in their creation. The Think Tank is also an incubator space that enables artists to spend time in residence, investigate crossovers with radical art practices and culture at large, and to engage with peers and members of the public. Pacitti Company Think Tank Residencies provide dedicated space for artists to research and develop new ideas and projects in our White Room. Over the years we have accumulated a great library of books related to live art, performance, the body, ritual, politics, science, visual arts, cinema, identity, counter culture and lots more besides. The Think Tank Library is a members-only study facility, bookable in slots of up to a half-day. Come and browse, read, and generally treat yourself to a day of brain food in our beautiful building. Pacitti Company offers a range of bespoke services. Made to Measure is a tailor made consultation service for both individual artists and small to mid scale companies who wish to address specific areas of their making process or public delivery.